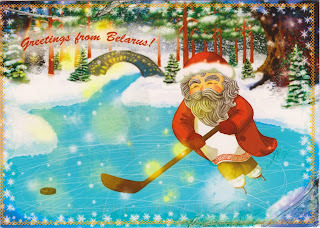 Postcard BY-1073799 from Belarus was one of the earliest Christmas themed cards that I received. It arrived in the mid November with Santa Claus playing ice hockey. It turns out that Minsk, the capital of Belarus, will host the 2014 International Ice Hockey Federation (IIHF) World Championship from May 9 to May 25, 2014. Good luck and Congratulations!